I’ve only been married for about two-and-a-half years, so I’m still getting the hang of this whole “domestic maven” thing. I mean, who knew that an apartment inhabited only by a wife, husband and toddler could get so dirty? Where does this dirt come from? I don’t remember inviting it in. One thing which I’m still realizing is that there are easily forgettable surfaces which still get dirty! 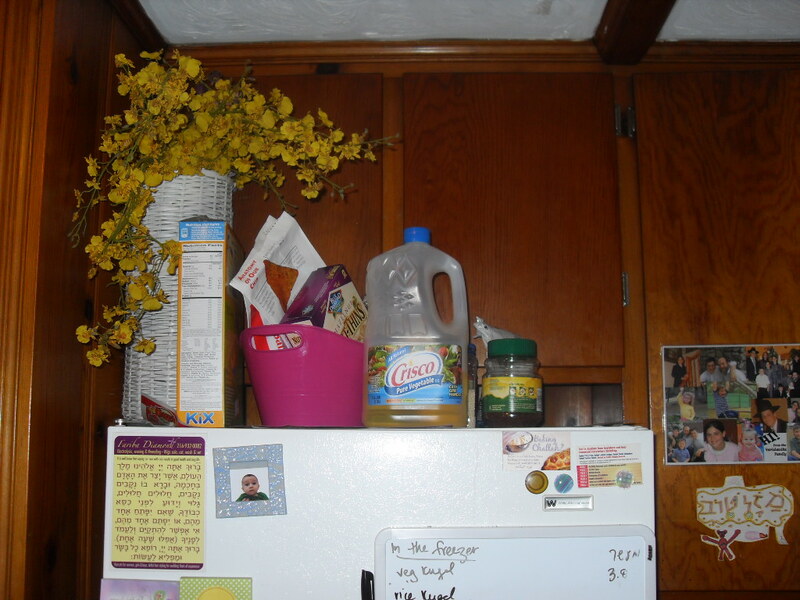 For instance, the top of the fridge. I can understand the floor, the stovetop, the oven, the counters…sure! I use those constantly. It makes sense to me that they would be dirty. But the top of the fridge? It just doesn’t make it into my cleaning rotation. Because of this oversight, some grossness had occurred up there. 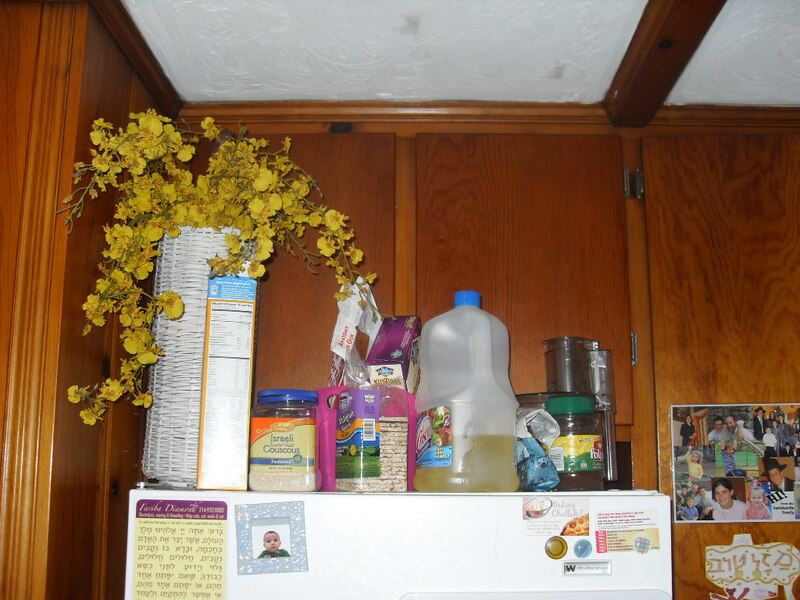 I use that surface area for storing various dry goods: Cereal; coffee; snack crackers and chips; and, currently, a massive bottle of vegetable oil which I bought instead of my more common normal-sized bottle. Lately, when I’ve been getting my coffee, there has been a disturbing sound accompanying the act. That is the sound of stickiness. 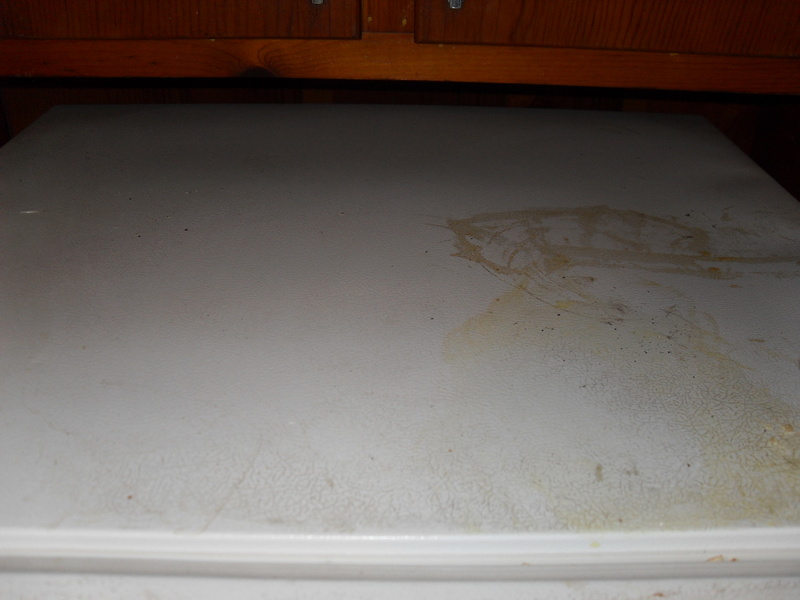 And that is when I realized that the top of the fridge needed a good scrubbing. Line the top of the fridge with paper!!!! 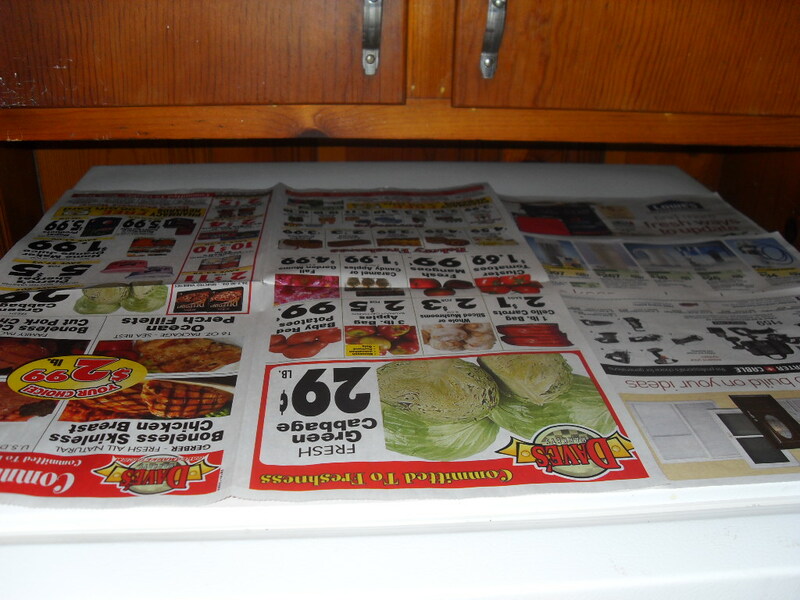 We receive many, many fliers advertising all sorts of specials, deals, whatever. Usually they just go in the recycling. However, it occurred to me that I could use these to line things in my apartment, like the bottom of the trash can, and now, the top of the fridge! Really, if anyone had told me ten years ago that I would be this excited about lining the top of my fridge (four exclamation marks?) so that cleaning it later would be a breeze, I would have rolled my eyes in disbelief. But, believe it! It’s a time saver! And who doesn’t love that? 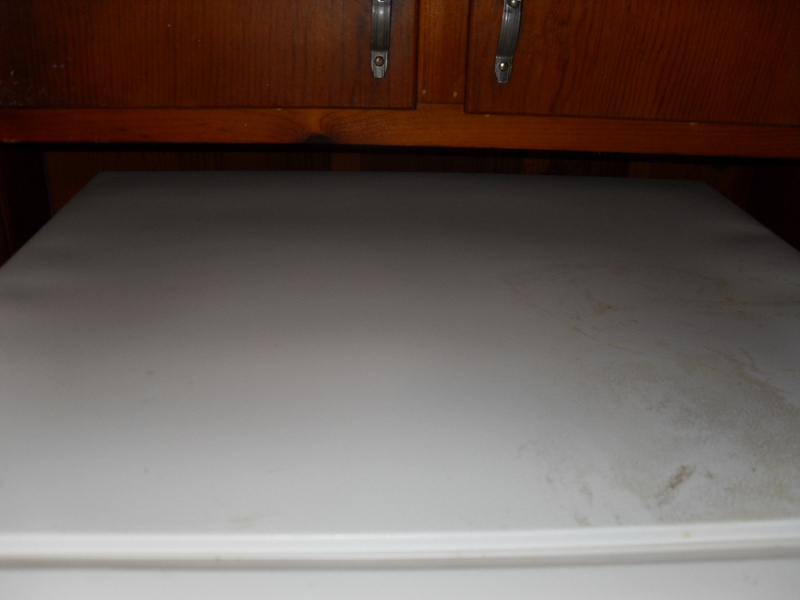 Plus, I’ll be saving on cleaning supplies, since all I will need to do to “clean” the top of my fridge in the future is switch out the papers. Score. ewwwww - needs a good scrub down! I am seeing so many similarities between us–your walking (I detest using my car), living in an apartment, and (soon to be) having two very young children. It makes me happy when I read your posts because what you say resembles so much of what I am going through. Such a good idea! I think I’m gonna do it too. Thanks for the tip! Glad the tip is helpful! We also have the cabinet issue. Whose ides was it to put cabinets up there anyways? I’m a fairly average height, but I still can’t reach up there. They are fairly useless, except for making cleaning the top of the fridge a greater challenge. We’ll foil them yet!